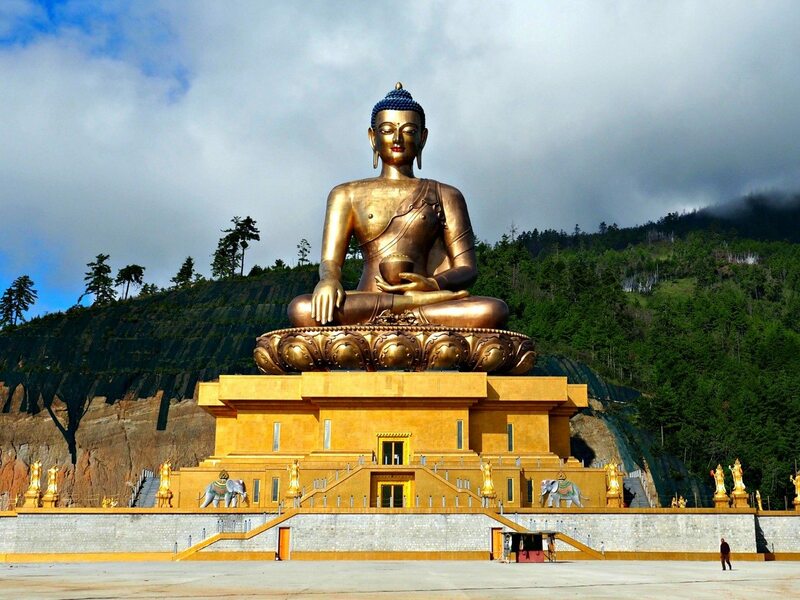 When I close my eyes I can still see Bhutan. 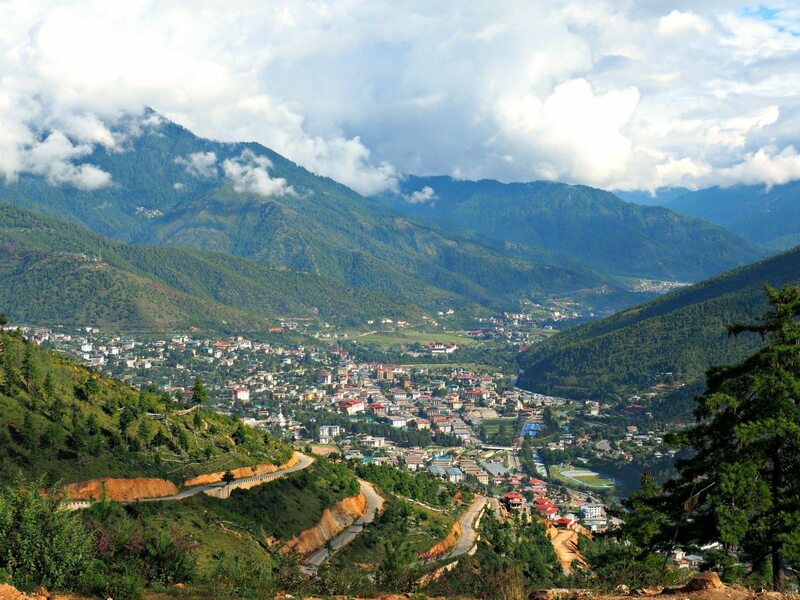 I can vividly see the lush green rice terraces, the statuesque Himalayan Mountains lining the horizon, and old chain bridges crossing a gentle river below. 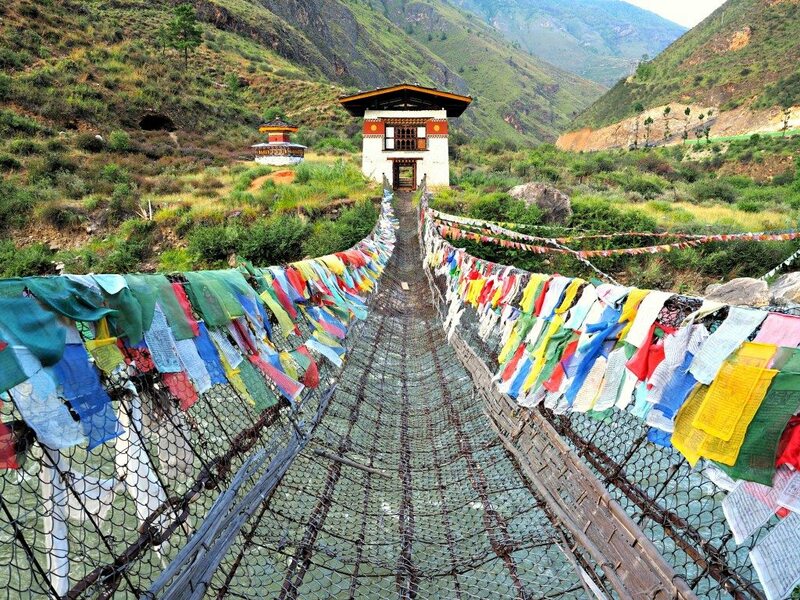 I see steep rocky cliffs lined with colorful Buddhist prayer flags swaying in the cool breeze. 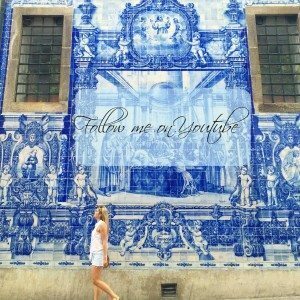 I see some of the most elaborate temples and buildings you can fathom. 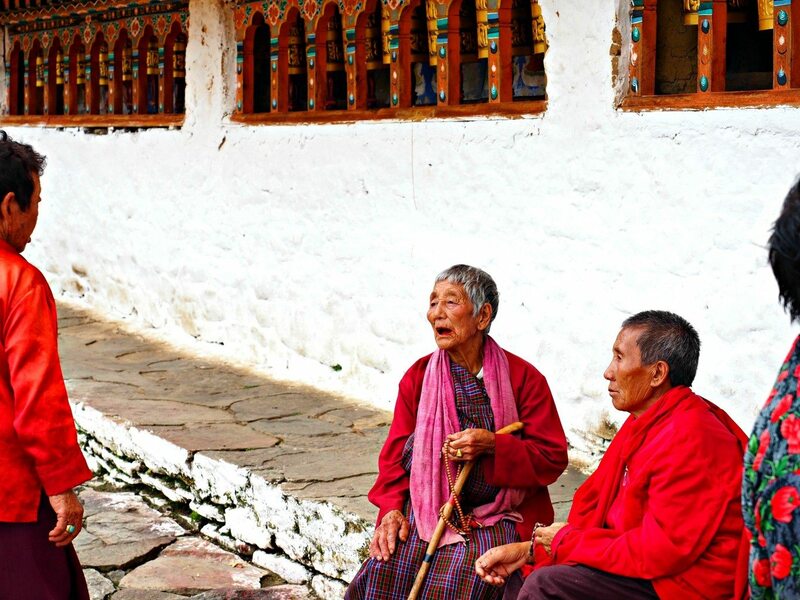 I see sweet smiles of Bhutanese natives happy to see foreigners enjoying everything their peaceful country has to offer. I’ve never in my life experienced a place so serene and so rich with beauty. 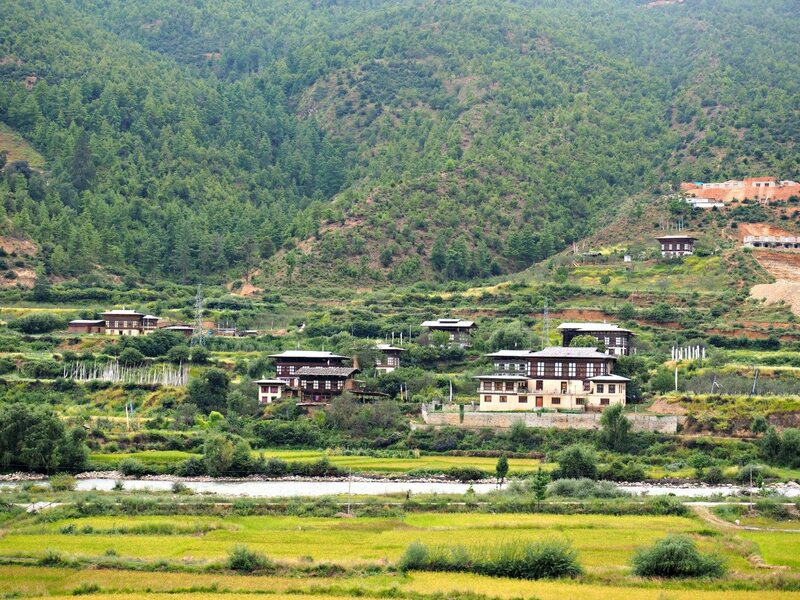 Bhutan has left a mark on my heart in ways I cannot explain. As my plane descended into the jewel of the Himalayan Mountains I was made aware by the girl sitting next to me that this airport is one of the most dangerous airports in the world and only 8 (!) pilots are qualified to fly into this airport because of the size of the small runway and the amount of maneuvering around the mountains it takes. Good thing I didn’t know that beforehand. The second I stepped off the plane I got an instant rush of serenity in a way so powerful I still don’t understand it. Here I was on this small runway engulfed by beautiful lush mountains everywhere. I looked over at the tiny airport and I was instantly mesmerized by the beautify of the architecture. The ornate detail is unlike anything I’ve ever seen before. 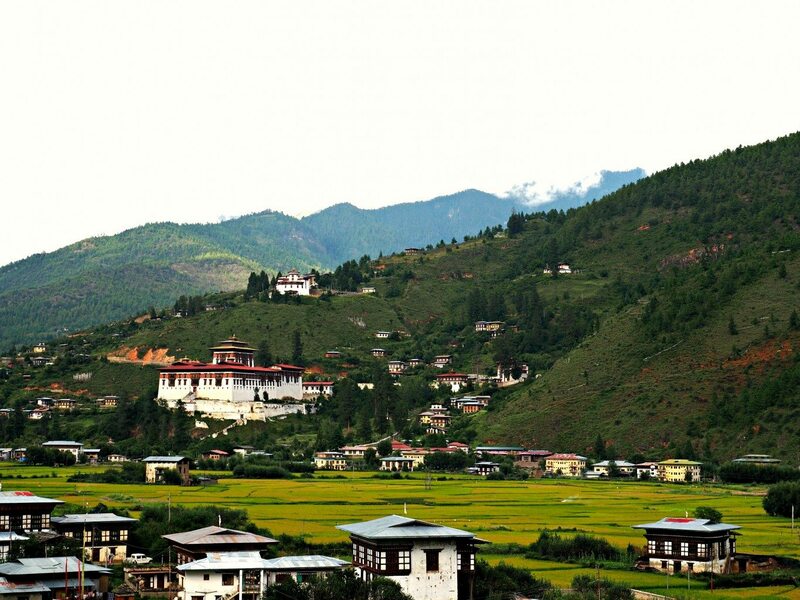 In Bhutan, in order to visit there, you must apply well in advance for a visa and if they can accommodate you there is a $250/day tourist visa fee. Now, I know that seems absurd BUT that includes everything. All of your food, accommodations, a guide, and a personal driver. Now $250 doesn’t seem that bad does it? 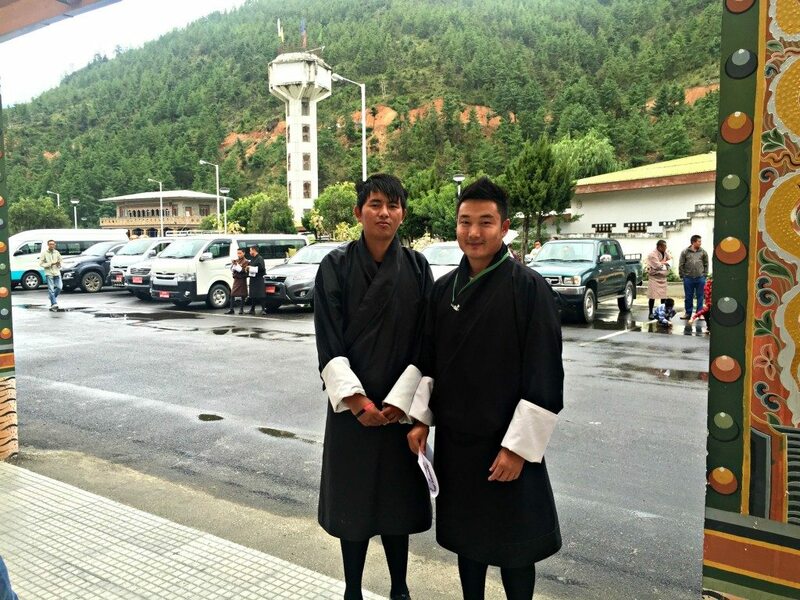 When I stepped out of customs I was greeted by my sweet guides, Dorji and Jigmy, and from the moment we met we were instantly friends. 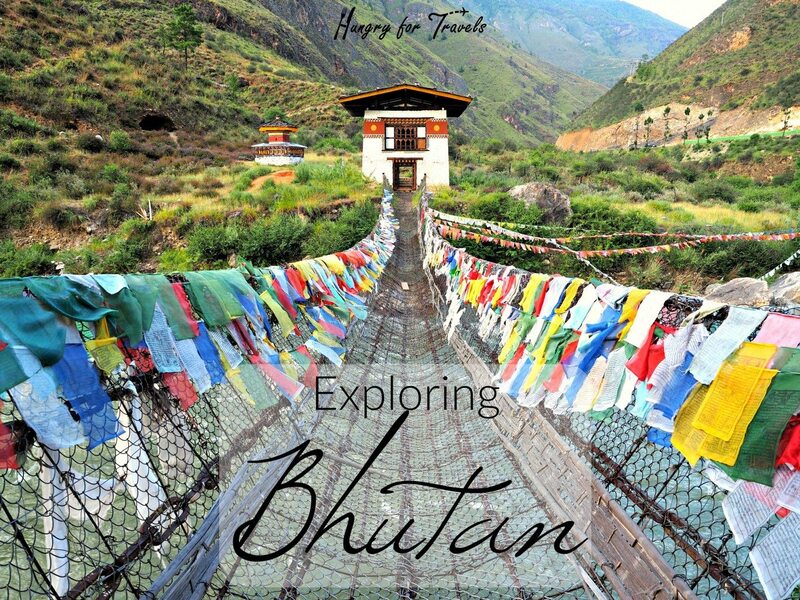 I hopped in the car with my new Bhutanese friends eager to explore everything Bhutan had to offer. My first stop was at the picturesque 14th Century Iron Bridge. From the moment I got out of the car I just stood there in disbelief of the beauty of the bridge and it’s surroundings. I couldn’t move I was so enamored. The crisp air blew around me while I watched the colorful prayer flags blow in the wind on this beautifully constructed old chain bridge. The gentle sound of the river babbling below instantly calmed any fear I had about crossing the bridge. I closed my eyes as I walked across it, waiting for the moment this mystical bridge was finally going to collapse and take me with it into the river below forever. As our car curved around the mountains I couldn’t help but keep my head out of the window the whole time, staring at the sprawling landscape randomly dotted with the picturesque traditional farm houses in the distance. Jigmy informed me that his favorite music to listen to was American rap music, so we cranked it up, singing and attempting to rap our way through the serene streets of Paro. 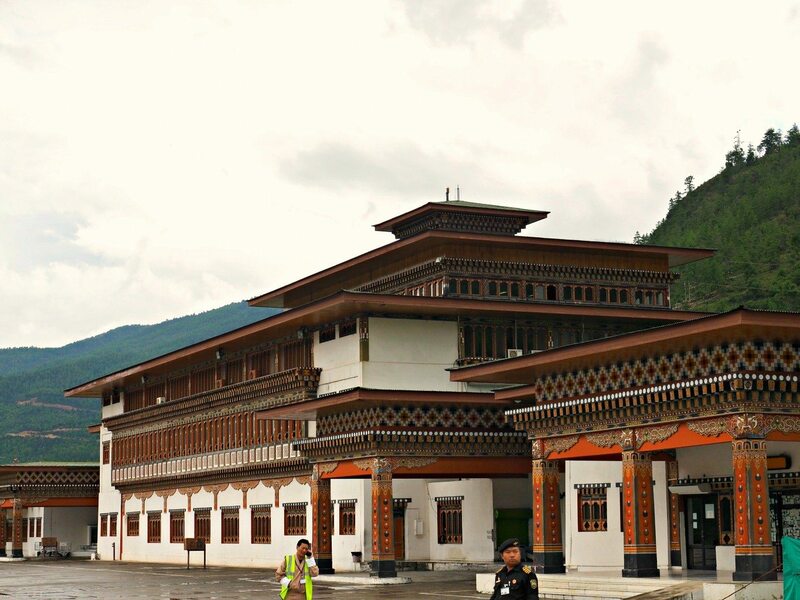 One of my favorite stops was seeing the Tashichho Dzong in Thimpu which triples as a monastery, a fortress, as well as where the government meets. There are large, elaborate, and exquisitely colorful floor to ceiling tapestries and paintings everywhere. Photography isn’t allowed but I considered sneaking one just so the world could see how impressive the inside of their Dzongs are. 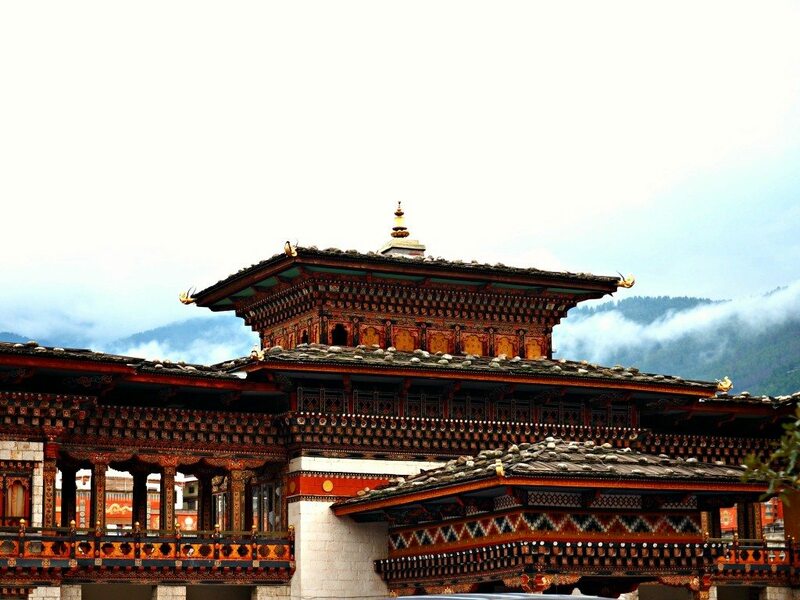 We walked, weaving in and out of monks, as Dorji explained to me the history of this peaceful country and their leaders. 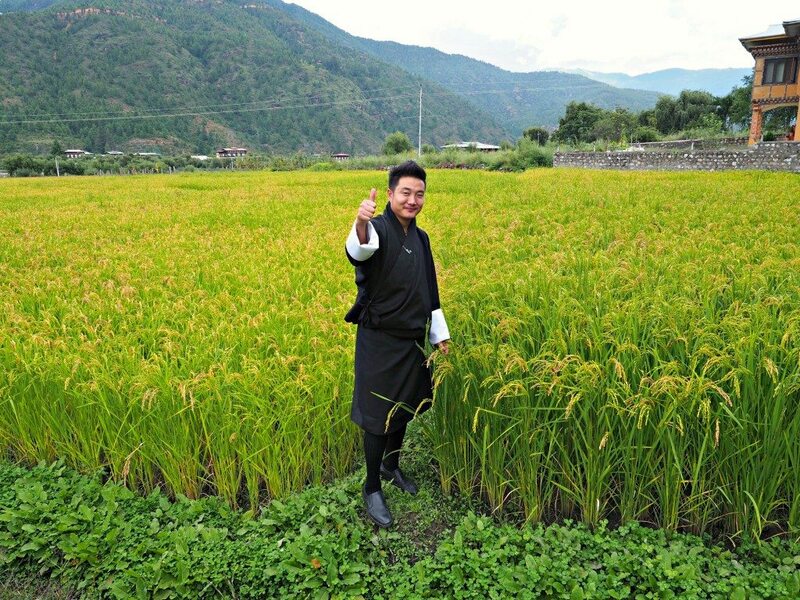 It was so refreshing seeing a country that loves and respects their leaders the way the Bhutanese people do. 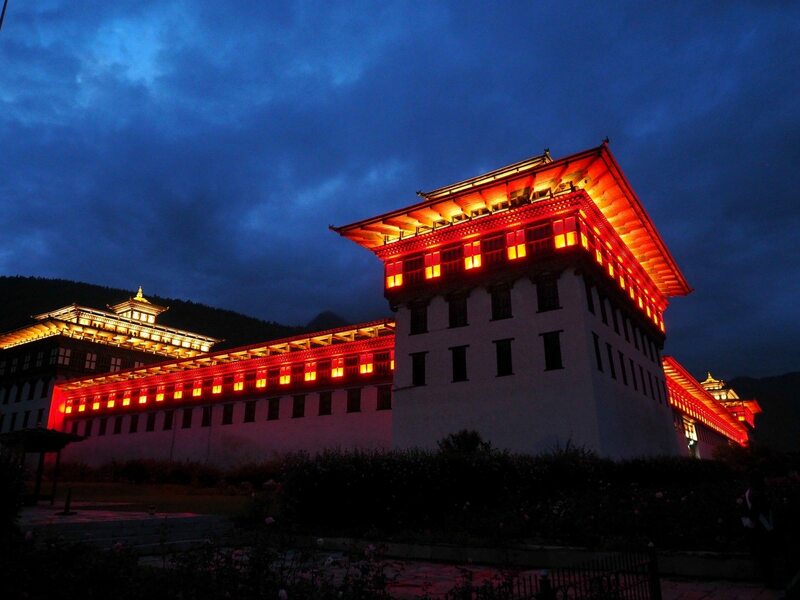 By the time we left the sun had just set, and the Tashiccho Dzong was lit up in the most spectacular way. Between that and the uninterrupted star lit night sky I was in heaven. I woke up early the next morning, eager and ready for what the day had in store. 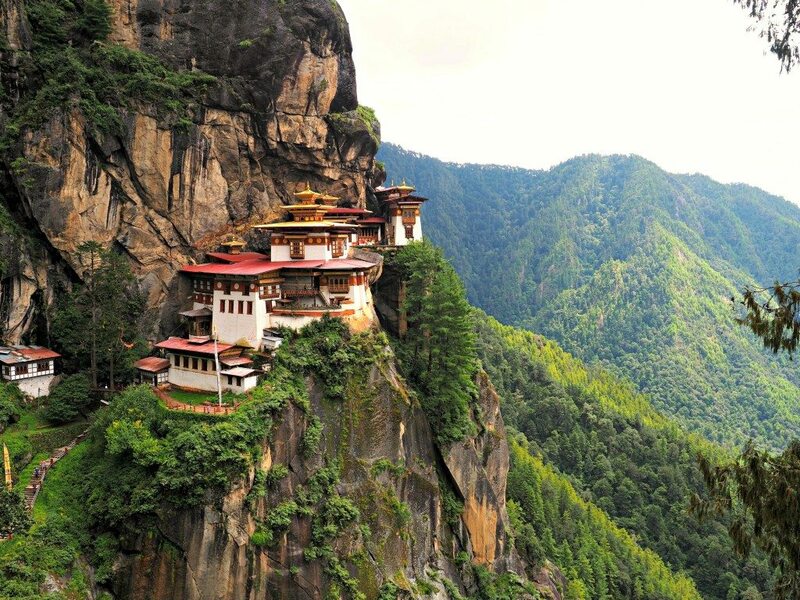 Today I was to hike to Tiger’s Nest Monastery, which was the whole reason I booked this side trip from Nepal. I was picked up by my guides after breakfast and we drove to the base of the mountain. As we were driving there I looked straight up the tree lined mountain, weary if I would be able to climb that high. The monastery looked so far away. 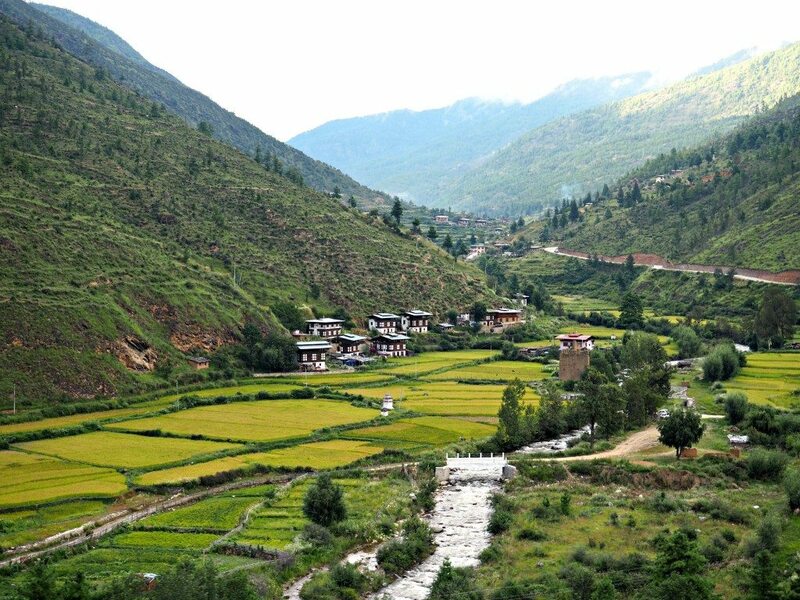 The altitude of Bhutan was slightly getting to me and I felt sluggish that morning waking up, but I refused to let that stop me. After a quick pep talk by my sweet guide Dorji we were off. I curiously asked him what his record time was up and when he said an hour and twenty minutes and my competitiveness kicked in determined to beat that. We started up the steep rocky mountain, schlepping through the mud that had developed from the late night rain the night before and the mysterious horse poop everywhere. I bounced from rock to rock avoiding the mud and poop at all cost while we slowly ascended up. I could feel the altitude setting in but my adrenaline refused to let me slow down. 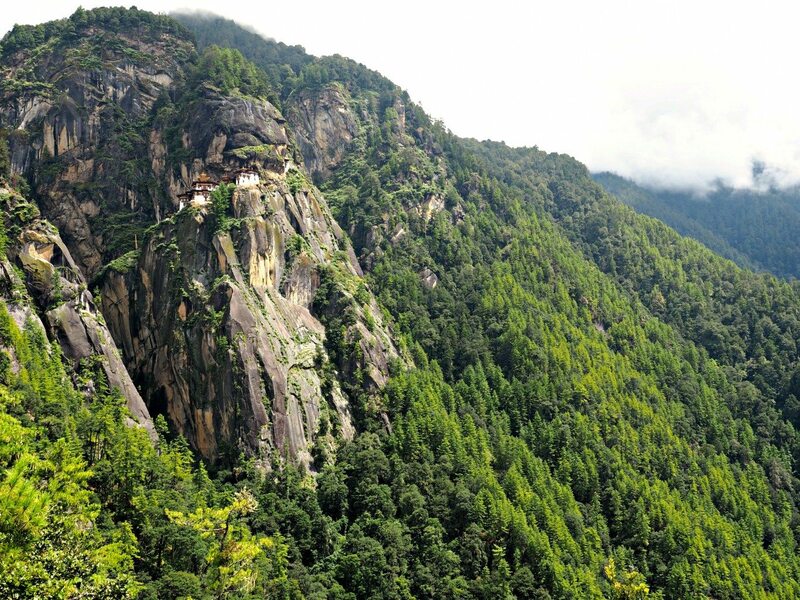 We finally reached the halfway mark and I got my first glimpse of the Tiger’s Nest Monastery high in the sky. So close, yet so far. We stopped for a quick water and tea break before continuing on. Up and up we climbed this majestic mountain, huffing from being out of breath, and from laughing at each others stories. I stopped a few times breathless, not because of the hike but because of the view from the mountain overlooking the lush pine trees below. It was so overwhelmingly beautiful. A grueling one hour and thirty minutes later I finally made it. 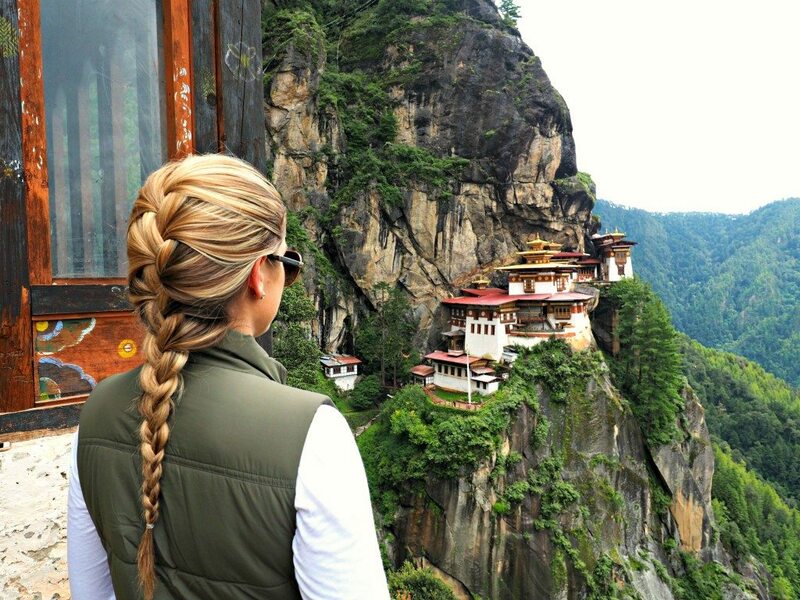 My first glimpse of the Tiger’s Nest Monastery felt like a dream. I stood there trying to catch my breath, staring, unable to move or say anything. I had to hold back tears from the rush of emotions I was feeling. I was completely and utterly consumed with the beauty of this amazingly intricate monastery perched high in the sky. It was an out of body experience like I’ve never felt before. 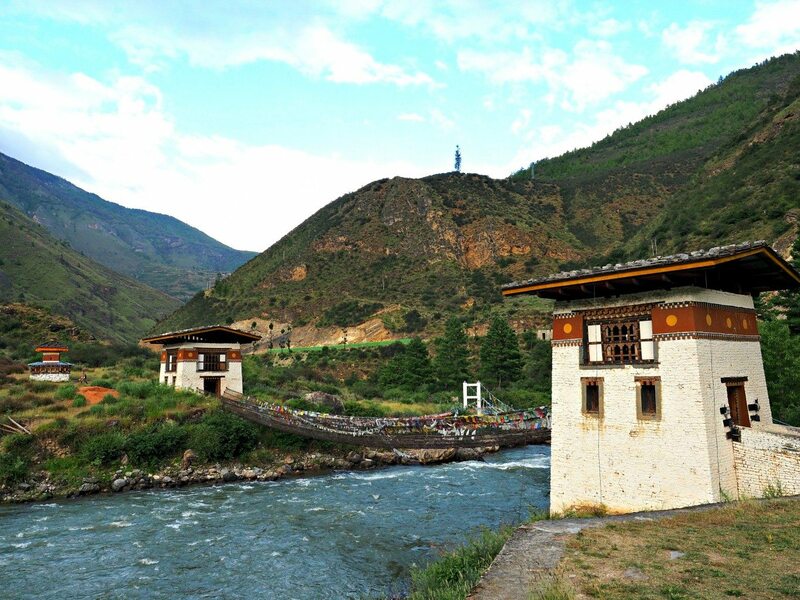 The magnitude of the beauty of this monastery and it’s surroundings is something I wish everyone could see in their life. After that initial viewing point there were stairs, and lots of them. First we headed straight down, then straight back up another couple hundred. By the time we passed the picturesque waterfall at the entrance I was completely and utterly out of breath, but I made it. Unfortunately because this site is so sacred no one is permitted to take pictures or bring their cameras inside. My guide and I spent hours walking around all the different colorful shrines lighting fragrant butter lamps and receiving blessings from Monks along the way. 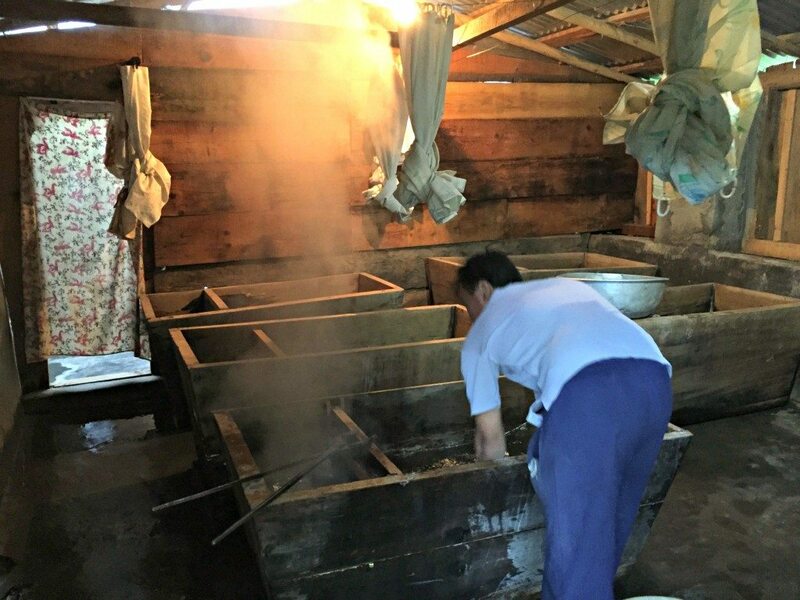 Once back at the mountain base I was informed that it is tradition to take a hot stone bath at a farm house after hiking to prevent any soreness and that’s where we were heading next. Hot stone bath? Well, twist my arm. We drove out into the deep country until we reached a beautiful well preserved old farm house. I was greeted by sweet older Bhutanese lady, her mouth red from chewing betel nut all day, and a cup of salted butter tea. She motioned for me to follow her past a roaring fire to a smaller wooden shed in the back of her house. I entered the shed and instantly noticed all of the handmade wooden tubs everywhere. One was filled with water and she made a motion signaling that would be mine. 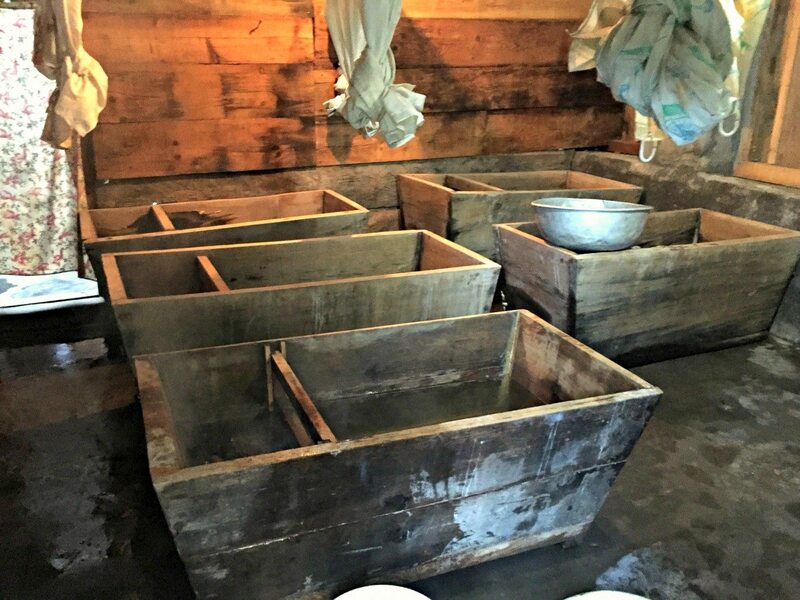 In this wooden tub there was a small slotted wooden divider blocking off about a quarter of the tub. I turned around and watched as the lady went out to the fire and collected hot stones, adding the stones to the small section of the tub. She put them in one by one, every stone setting off heaps of steam into the room. She tested the water by hand until it was the perfect temperature and she told me to change and get in. I sat in the bath as the stones were still sizzling, giggling to myself. Here I sat alone in a wooden bath, with rocks freshly picked out of a fire, in the middle of nowhere Bhutan. Life can be so funny sometimes. 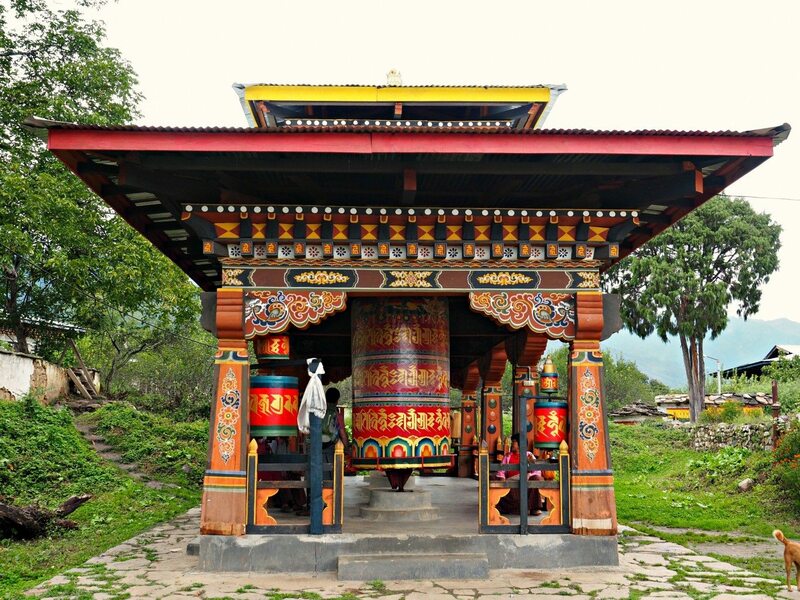 From here I saw so many different and equally as beautiful monasteries, stupas, and shrines. I went out singing ‘Achey Breaky Heart’ karaoke and drinking Bhutanese beer till the early morning with my new friends. 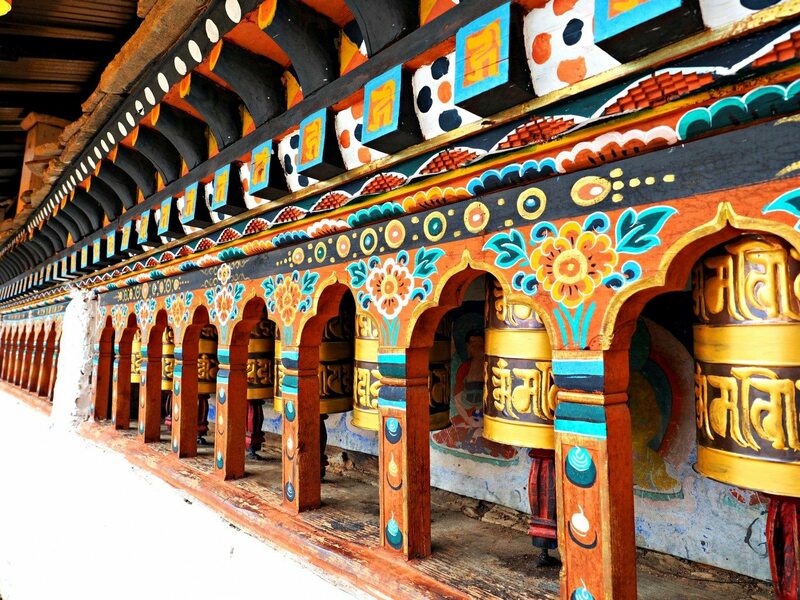 I explored the beautiful downtown areas of both Paro and Thimpu, marveling at the architecture and the natural surrounding beauty. I devoured delicious and very spicy Bhutanese food like their national dish of ‘chili cheese’ which is extremely spicy chilies cooked in a cheese sauce and served over rice. 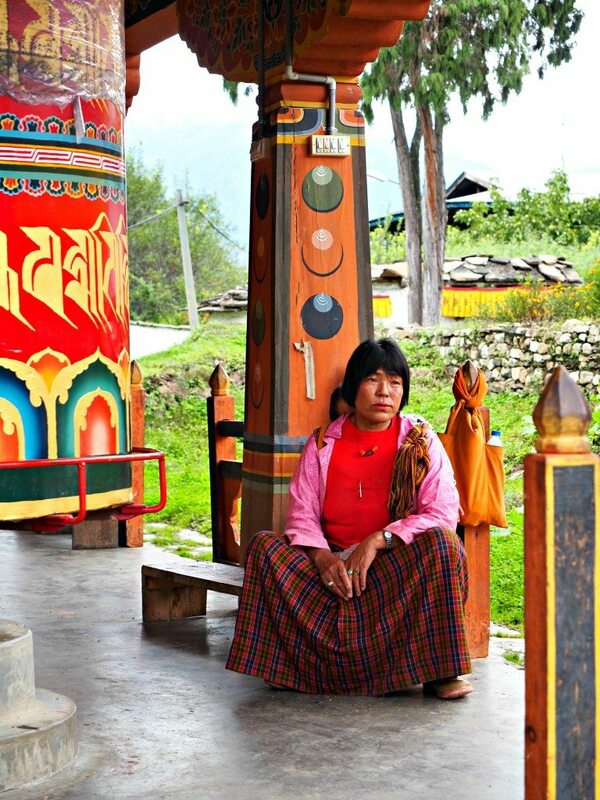 I admired the Bhutanese culture, their outlook on life, their happiness, and willingness to not succumb to change. I made friends that I will keep in touch with and made memories with them that will last a lifetime. When I got on my flight to leave I did something I never do, I cried. I cried not only tears of sadness because I was leaving, but tears of happiness for being able to experience a place so wonderful. I know I will be back one day, my heart won’t let me not go back.